Welcome to the world of the odd, intriguing & strangely compelling. 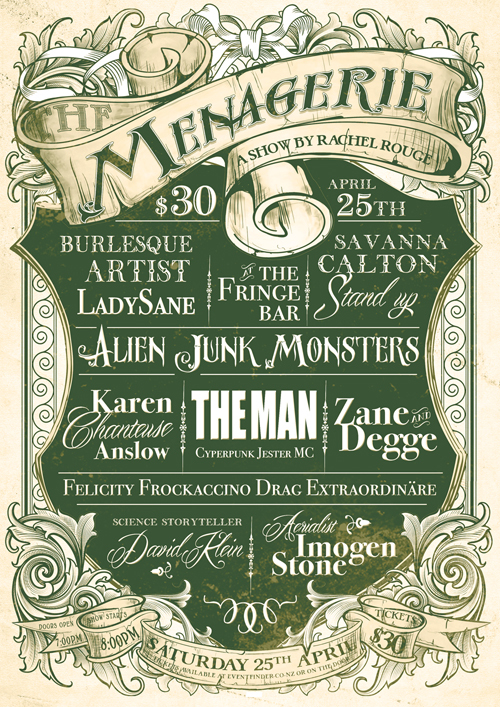 The Menagerie is a regular variety night based in Wellington New Zealand. In 2019, we plan to do only 2 shows: one in the Wellington Opera House on the 27th of July 2019, and one in the Christchurch Isaac Theatre Royal on the 22nd of June 2019. We’ll let you know as soon as tickets are online. 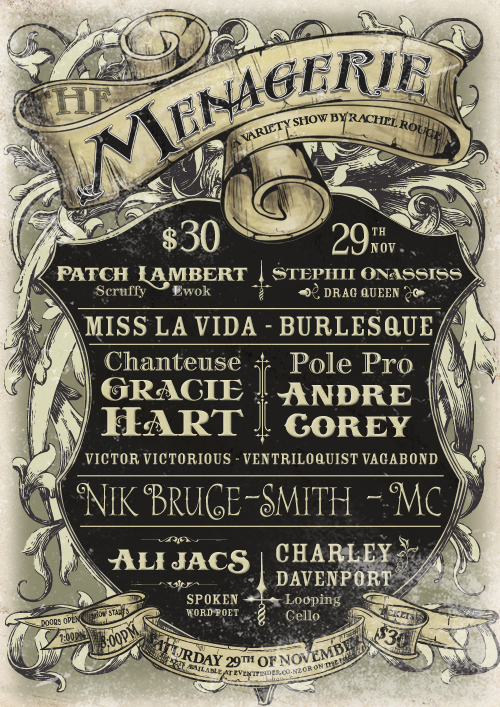 Every show is different and can contain a mix of dancers, singers, comedians, spoken word poets, magicians, contortionists, hula hoopists, acro-balancers, mimes, carnies, ner-do-wells, drag queens/kings, and circus freaks. Have a perv at the top quality performers we work with, join our mailing list, like us on Facebook (we are not needy, we just like to be liked). 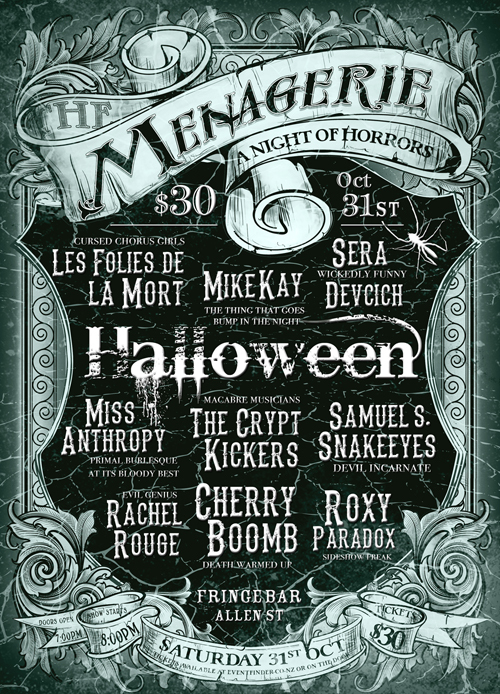 Our fabulous (and award winning) poster designs are created by Carlos de Treend. 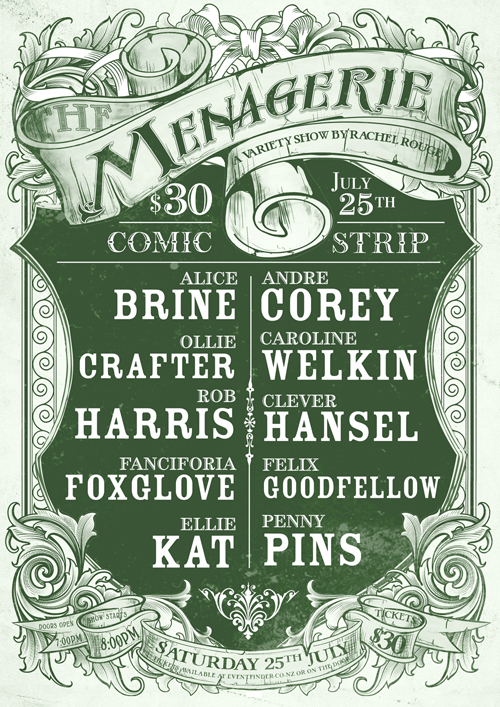 The Menagerie Deluxe, Saturday 2nd of September. 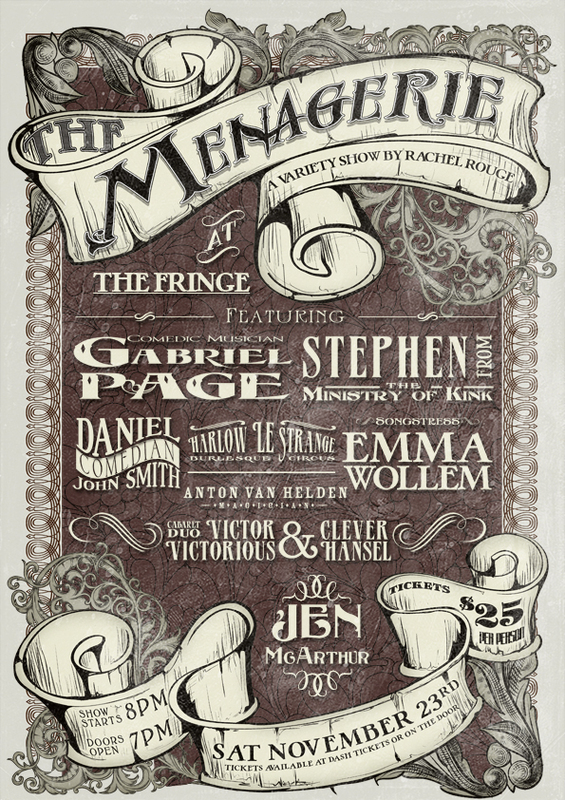 8pm at the Opera House, Wellington. 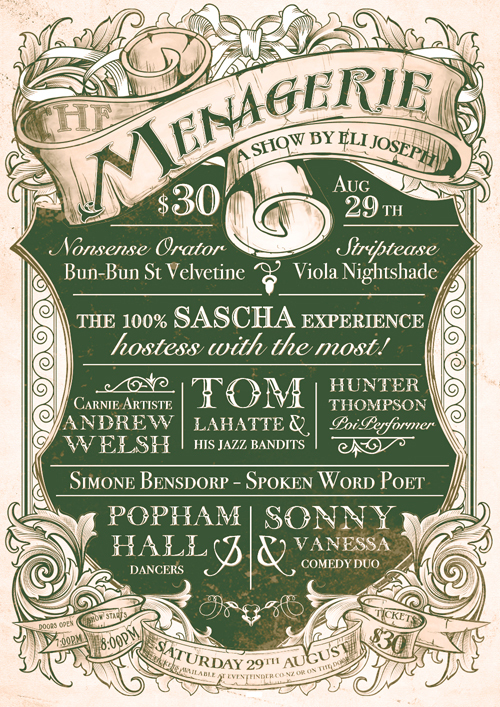 Show is at 8pm at The Fringe bar, Wellington, Saturday the 29th of August, guest produced by Eli Joseph. 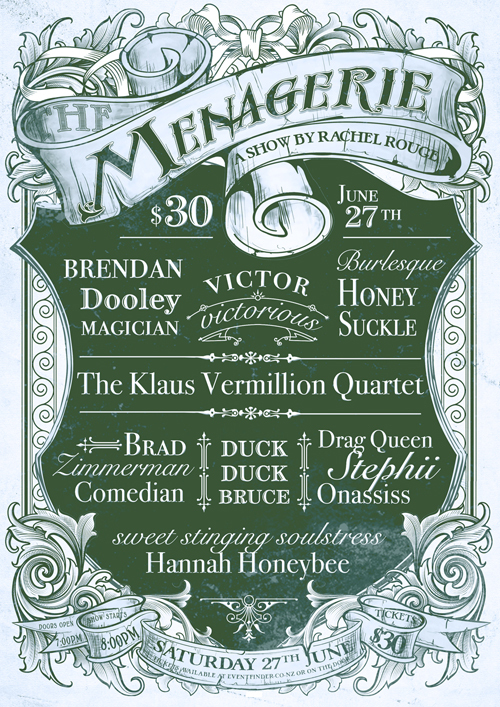 Show is at 8pm at The Fringe bar, Wellington, Saturday the 27th of June. 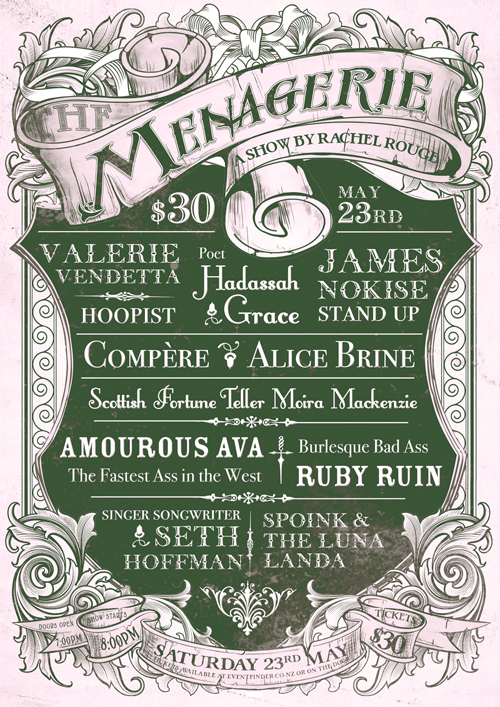 Show is at 8pm at The Fringe bar, Wellington, Saturday the 25th of April. 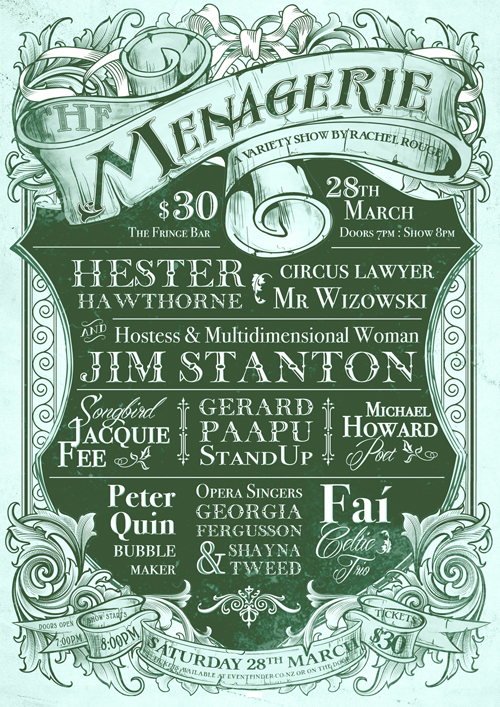 Show is at 8pm at The Fringe bar, Wellington, Saturday the 28th of March. 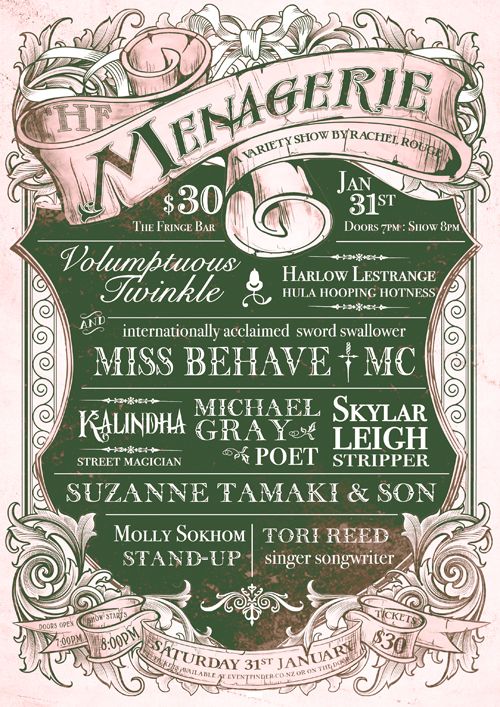 Show is at 8pm at The Fringe bar, Wellington, Saturday the 31st of January. Show is at 8pm at The Fringe bar, Wellington, Saturday the 29th of November. 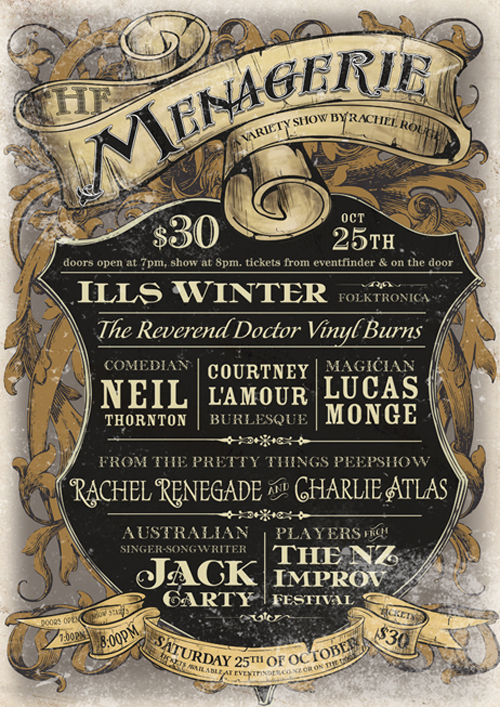 Show is at 8pm at The Fringe bar, Wellington, Saturday the 25th of October. 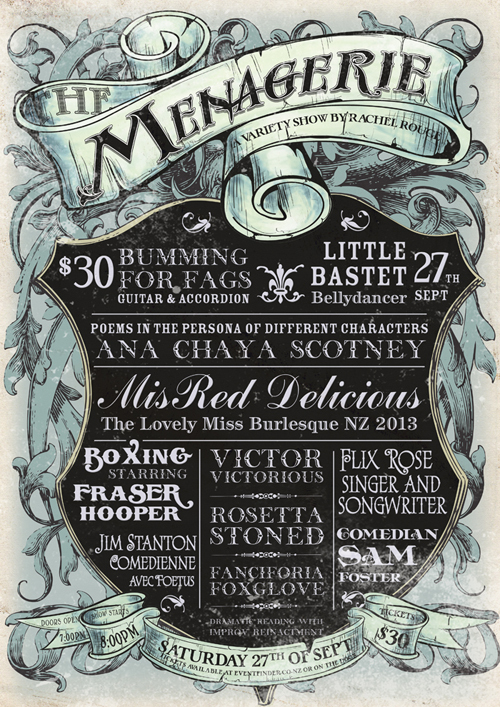 Show, 8pm at The Fringe bar, Wellington, Saturday the 27th of September. 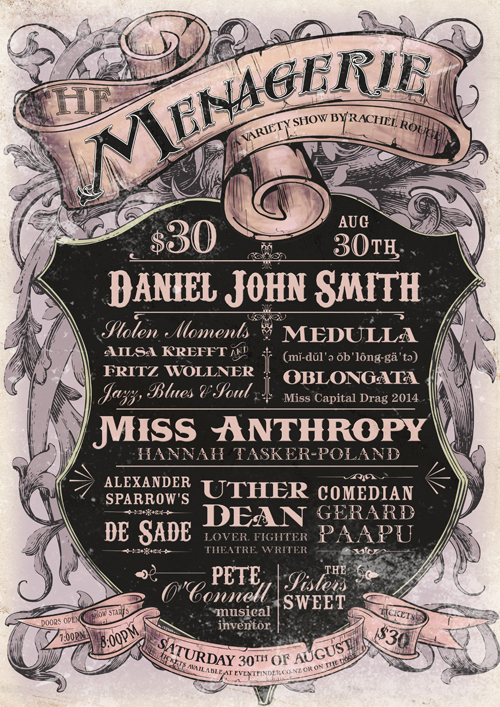 Show, 8pm at The Fringe bar, Wellington, Saturday the 30th of August. 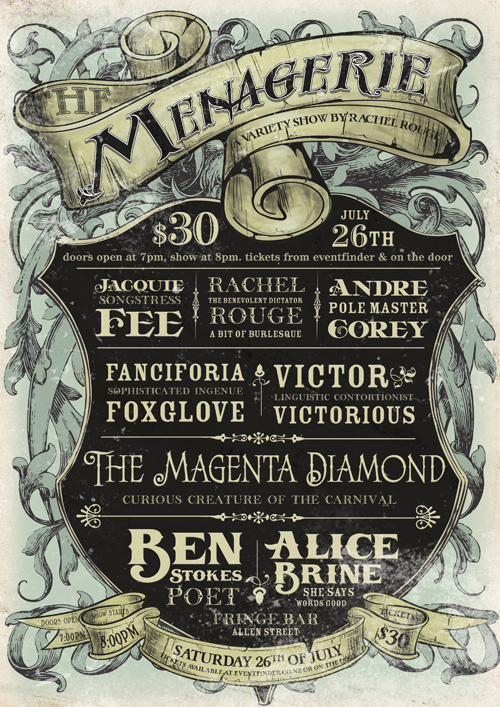 Show, 8pm at The Fringe bar, Allen St Wellington, Saturday the 26th of July. 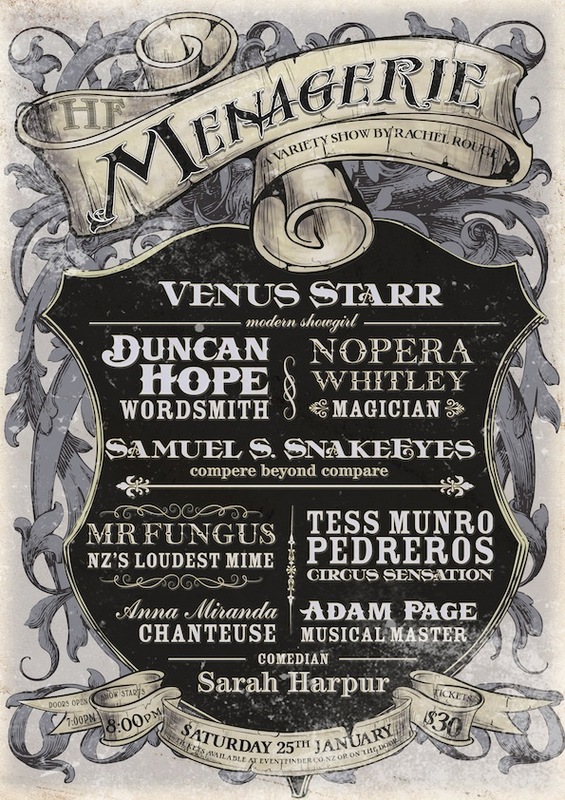 Special Matariki show, 8pm at The Fringe bar, Allen St Wellington, Saturday the 28th of June. 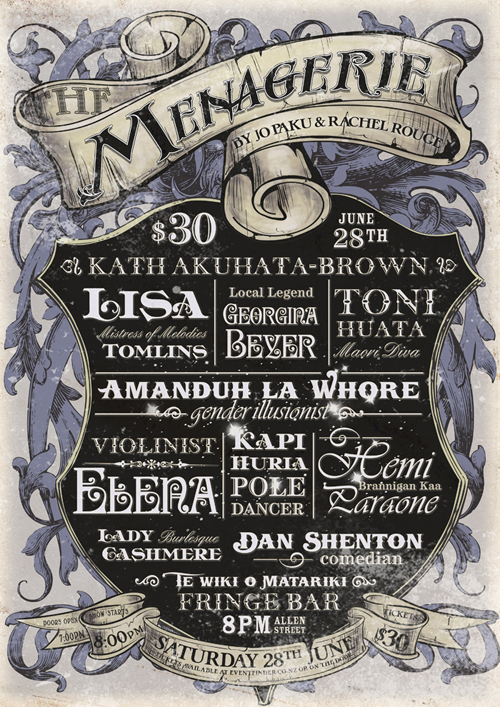 Show, 8pm at The Fringe bar, Allen St Wellington, Saturday the 24th of May. 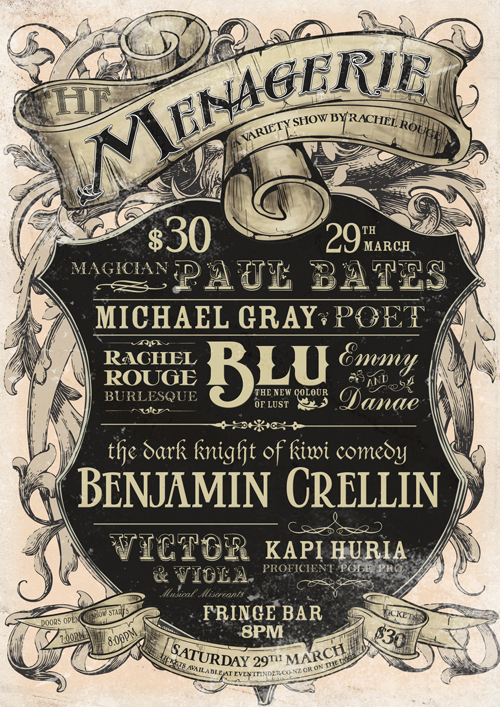 Show, 8pm at The Fringe bar, Allen St Wellington, Saturday the 29th of March. Woot! 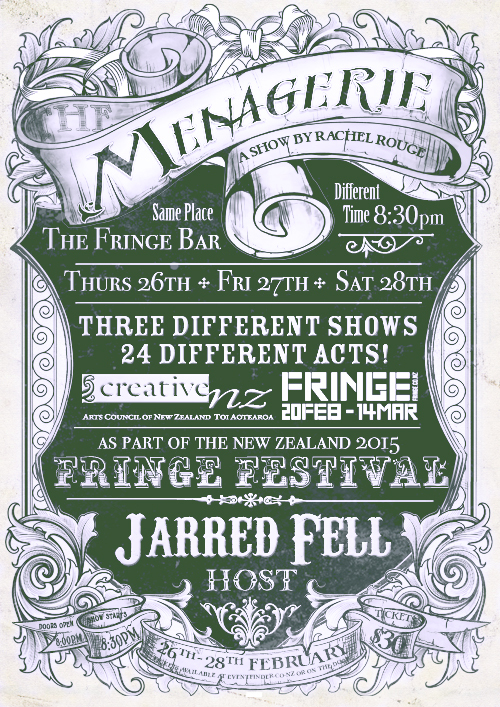 Show, 8pm at The Fringe bar, Allen St Wellington, Saturday the 25th of January. Woot!